I attended this afternoon's Grand Launching of Flawless at Centrio - Ayala Mall here in Cagayan de Oro City. One of their endorsers is the all-female band General Luna. 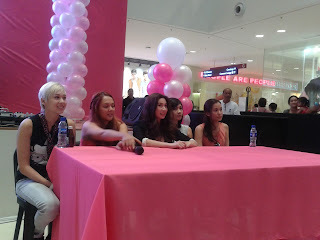 Flawless invited some media partners and that includes CDO Bloggers. During the press conference for General Luna, we had the chance to ask them questions about their band and about the product they are endorsing. After the Q & A portion, local models did the catwalk on the stage. General Luna then performed at least three songs from their album. The grand launching was very successful and the night was fun. We were given freebies from Flawless and I will definitely use this. GL also gave us a copy of their CD. I also had a chance for a photo op to some of their members. I wish Flawless more success as well as the GL band.